Capt. Neil Stanley BYNUM [Parents] was born on 29 Jun 1943 in Vian, Sequoyah, Oklahoma. He died in MIA Oct 1963 in Vietnam. Neil married Pat FORD. Pat FORD. Pat married Capt. Neil Stanley BYNUM. F i Angel BYNUM was born on 25 Dec 1968. William ROBERTS [Parents] was born about 1795 in , , North Carolina. He died on 18 Dec 1868 in Buffalo, Newton, Missouri. He was buried in , Newton, Missouri. William married Sally Vienna HORTON. Sally Vienna HORTON [Parents] was born in 1801 in , , Virginia. She died in 1870 in Buffalo, Newton, Missouri. Sally married William ROBERTS. M i Robertson William ROBERTS was born on 11 Mar 1821. He died on 4 Nov 1862. M ii Josiah Brown ROBERTS was born on 18 Feb 1822. He died on 11 Jul 1880. M iii Andrew Jackson ROBERTS "Sr" was born in Jul 1822. He died on 3 Jan 1908. M iv James T. ROBERTS was born in 1829. He died on 26 Dec 1912. Stephen ROBERTS was born about 1830 in , , Kentucky. M vi Rufus Bolton ROBERTS was born in 1834. He died in 1866. M vii David ROBERTS was born in 1838. Joseph E. ROBERTS was born in 1842. M ix Bennett ROBERTS was born in 1843. James CRABTREE was born on 22 Jul 1814 in , , Tennessee. He died on 14 Dec 1878 in , Grayson, Texas. James married Mary A..
Mary A. was born in 1817 in , , Tennessee. She died in 1843. Mary married James CRABTREE. F i Carolyn Emeline CRABTREE was born in 1838. She died on 22 Feb 1927. Jesse Lee ROBERTS [Parents] was born in Nov 1890 in Gordonville, Grayson, Texas. He died in 1954 in Ada, Pontotoc, Oklahoma. He was buried in Box "X" Cemetery, Bebee, Pontotoc, Oklahoma. Jesse married Maud IRWIN on 12 Aug 1914. Maud IRWIN [Parents] was born on 22 Apr 1887 in , , Texas. She died on 17 Aug 1971 in Addington, Jefferson, Oklahoma. She was buried in Box "X" Cemetery, Bebee, Pontotoc, Oklahoma. Maud married Jesse Lee ROBERTS on 12 Aug 1914. Zela ROBERTS was born about 1914. F ii Buelah ROBERTS was born in 1915. M iv Albert Lee "Al" ROBERTS was born on 18 Apr 1917. He died on 29 Jul 1998. M v Alfred Earl ROBERTS was born on 14 Feb 1919. He died on 15 Jul 1993. 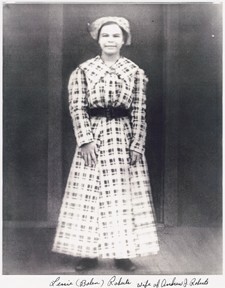 F vi Oneta ROBERTS was born about 1920. Andrew Jackson ROBERTS [Parents] was born on 14 Dec 1893 in Gordonville, Grayson, Texas. He died on 2 Mar 1964 in Oil Center, Pontotoc, Oklahoma. He was buried on 4 Mar 1964 in Box "X" Cemetery, Beebee, Pontotoc, Oklahoma. Andrew married Lessie Leona BOLEN on 30 Apr 1913 in Konawa, Seminole, Oklahoma. Lessie Leona BOLEN [Parents] was born on 2 Mar 1896 in , Johnson, Oklahoma. She died on 17 Mar 1944 in Oil Center, Pontotoc, Oklahoma. She was buried on 20 Mar 1944 in Box "X" Cemetery, Bebee, Pontotoc, Oklahoma. Lessie married Andrew Jackson ROBERTS on 30 Apr 1913 in Konawa, Seminole, Oklahoma. F i Mary Gladyes ROBERTS was born on 18 Jun 1914. She died on 9 Jan 1962. M ii Melvin Jackson "Jack" ROBERTS was born on 10 Jun 1917. He died on 23 Mar 2003. M iii Hobert Lee Francis "Toots" ROBERTS was born on 5 Apr 1921. He died on 17 Jan 1946. M iv Amos ROBERTS was born about 1923. He died on 10 Feb 1968. M v Earnest L. "Ernie" ROBERTS was born on 29 May 1927. He died on 31 Aug 1998. George W. LEWIS [Parents] was born in 1895 in , , Tennessee. He died in 1968 in Ada, Pontotoc, Oklahoma. He was buried in 1968 in Rosedale Cemetery, Ada, Pontotoc, Oklahoma. George married Gertie C. ROBERTS on 13 Dec 1916 in Konawa, Seminole, Oklahoma. 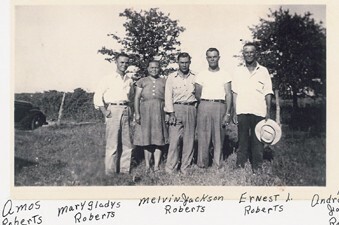 Gertie C. ROBERTS [Parents] was born on 14 Jul 1901 in Gordonville, Grayson, Texas. She died on 12 Jan 1999 in Ada, Pontotoc, Oklahoma. She was buried on 14 Jan 1999 in Rosedale Cemetery, Ada, Pontotoc, Oklahoma. Gertie married George W. LEWIS on 13 Dec 1916 in Konawa, Seminole, Oklahoma. M i Walter Martin LEWIS was born on 30 Jun 1919. He died on 27 May 2007. James A. LEWIS. James married Elizabeth. Elizabeth. Elizabeth married James A. LEWIS. M i George W. LEWIS was born in 1895. He died in 1968. Allie P. ROBERTS [Parents] was born on 24 Jan 1905 in Gordonville, Grayson, Texas. He died on 13 Feb 1967 in Ada, Ponotoc, Oklahoma. He was buried on 15 Feb 1967 in Rosedale Cemetery, Ada, Pontotoc, Oklahoma. Allie married Argie ROBBINS on 4 Jul 1924. Argie ROBBINS was born on 4 Apr 1900 in , , Oklahoma. She died on 24 Mar 1976 in Ada, Pontotoc, Oklahoma. She was buried on 27 Mar 1976 in Rosedale Cemetery, Ada, Pontotoc, Oklahoma. Argie married Allie P. ROBERTS on 4 Jul 1924. F i Nadine Clemmie ROBERTS was born on 25 May 1925. She died on 8 Jan 1957. F ii Clarice ROBERTS was born on 8 Jun 1928. M iii Martin Lee ROBERTS was born on 11 Jun 1935. 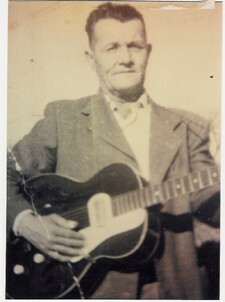 Frank Bonnie ROBERTS [Parents] was born on 14 Feb 1908 in Bebee, Pontotoc, Oklahoma. He died on 24 Apr 1966 in Ada, Pontotoc, Oklahoma. He was buried on 26 Apr 1966 in Maxwell Cemetery, Pontotoc, Oklahoma. Frank married Pearl MC CUTCHEON on 6 Aug 1927 in Bebee, Pontotoc, Oklahoma. 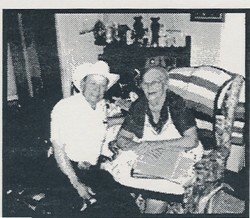 Pearl MC CUTCHEON [Parents] was born on 20 Dec 1909 in Quail, Collingsworth, Texas. She died on 21 Jun 1990 in Roff, Pontotoc, Oklahoma. She was buried in Maxwell Cemetery, Pontotoc, Oklahoma. Pearl married Frank Bonnie ROBERTS on 6 Aug 1927 in Bebee, Pontotoc, Oklahoma. M i James Edward ROBERTS was born on 2 Jan 1938/1939. M ii Vernon Dwayne "Boonie" ROBERTS was born on 10 Feb 1940. He died on 4 Nov 2006. James W. MC CUTCHEON was born on 9 Apr 1879. He died on 9 May 1960 in Ada, Pontotoc, Oklahoma. He was buried in Rosedale Cem., Ada, Pontotoc, Oklahoma. James married Nora L. WHITE. Nora L. WHITE [Parents] was born on 30 Oct 1887 in , , Texas. She died on 31 Aug 1930 in Ada, Pontotoc, Oklahoma. She was buried in Rosedale Cem., Ada, Pontotoc, Oklahoma. Nora married James W. MC CUTCHEON. F i Pearl MC CUTCHEON was born on 20 Dec 1909. She died on 21 Jun 1990.